Blade angle, the angle between stirring shaft and mixing blade, which has important influence on the aggregate operation direction and axial velocity. When the blade Angle is zero, blade and the stirring shaft are in parallel condition, and aggregate driven by blade only do circular motion. No axial force, it won’t produce axial movement at that time. Even mixing time prolonged, mixing quality won’t be improved. The blade Angle in the process of gradually increased from 0 to 90 °, the axial velocity will get bigger. But the axial movement of the speed will be weak after the angle more than a certain degree, at the same time, the circular motion of aggregate will be smaller. Finally, the mixing quality is poorer, mixing efficiency is lower. When the Angle is 90 °, mixing blade will be perpendicular with the stirring shaft, at that time, it is equal to a vertical stirring shaft tablet, the blade will lost aggregate agitation. Therefore, only controlling the mixing blades and the stirring shaft Angle in appropriate range, the aggregate can achieve good mixing effect, and meet the requirements of the quality and efficiency. 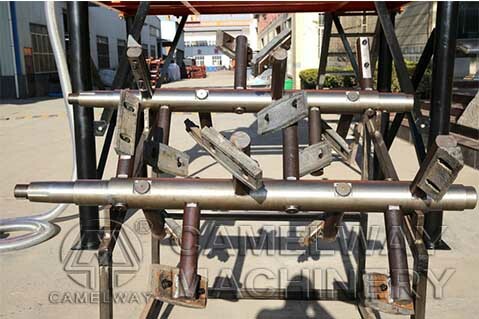 Zhengzhou CamelWay Machinery manufacture develops and produces mixing equipment which will satisfy your different requirements. If you want to buy it, you can contact us.